Every year the Kansas Oil Museum offers two week-long summer camps for children ages 8-12. These camps make full use of our galleries, outdoor exhibit area, and education collections, and provide an exciting hands-on way for kids to learn about the history and science that have shaped Butler County and Kansas. For 2018 we are excited to announce two brand-new summer camps in partnership with the Butler County Farm Bureau and the Coutts Museum of Art! These two camps will highlight the role of farming and ranching in Kansas, both historically and right here in Butler County today. Participants will learn all about different careers in agriculture and life science, meet actual professionals in these fields, and even have close-up encounters with crops and livestock at the museum and fairgrounds! These two camps will run all day, 8am to 5pm, July 23-27 and July 30-August 3. Mornings will be spent at the Kansas Oil Museum and/or the Butler County Fairgrounds, with afternoon sessions taking place at the Coutts Museum. Groups will be conducted between the two museums by summer camp staff, so no need for parents to shuttle kids between venues! Children are requested to bring their own sack lunches each day. Enrollment for each camp is $90/child for members, $100/child for non-members. Limited scholarships are available for families experiencing financial hardship. For more information or to sign up, please get in touch with us by calling (316) 321-9333, or fill out the form below. We will then be in touch to complete your registration! summer camp 2018 -- sign up today! Making rain clouds on meteorology day. 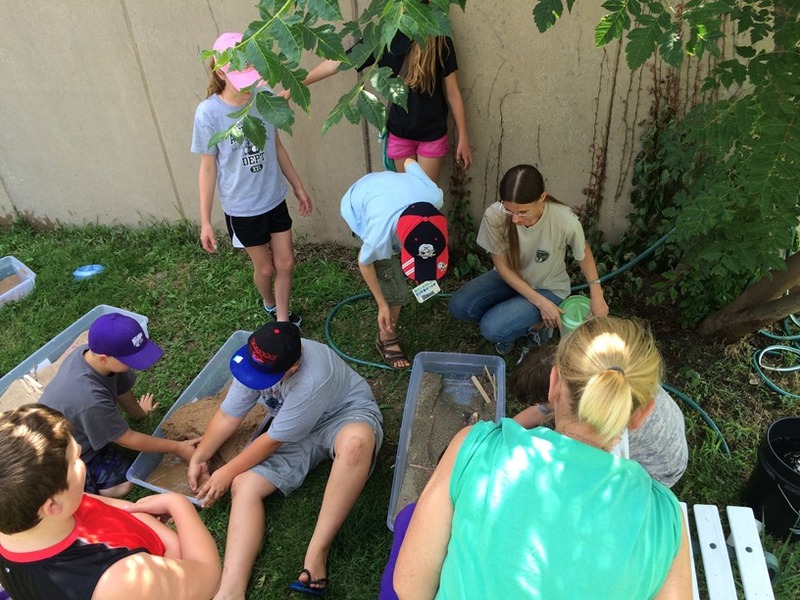 Building dams and learning about water flow. Someone finds a spider on ecology day! Excavating and interpreting artifacts on archaeology day. Searching for clues to the past. Chart a course through history as we learn how people have used technology to adapt to their surroundings over time. Find out what technology is, where it comes from, and how it has left its mark on our daily lives throughout human history. From the tools of the early Native Americans to the first pioneers crossing the prairie, all the way up to the early aviation and oil industries, kids will be challenged to tackle some of the technological problems of the past by putting their own innovation to use! A variety of activities and crafts throughout our museum and grounds will bring history to life and give kids something to bring home and show off every day! In 2015 kids from El Dorado and the surrounding area came out to the museum for our History Explorers camp, June 8-12, and our Earth Explorers science camp, June 22-26. Check out the slideshow to see some of the fun we had!